As usual, I got to the library about 5 minutes before closing time, and was trying to look up several things. 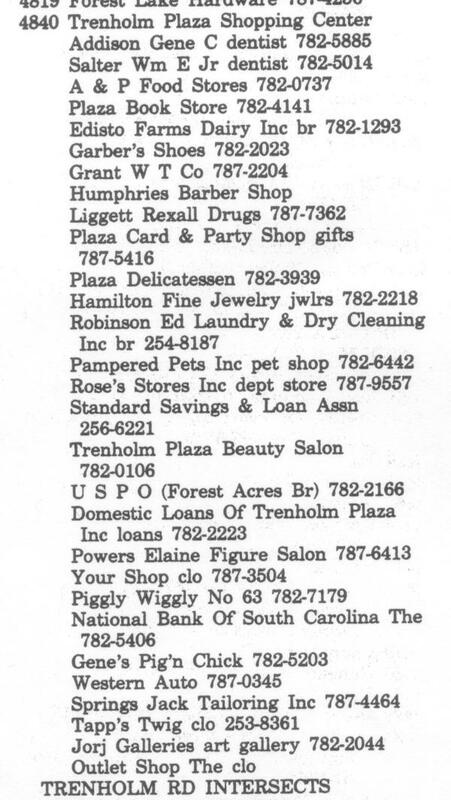 One of them was old City Directory listings for Trenholm Plaza. In the event, I got two, one for 1964, when I would have been three years old, and perhaps dimly conscious that we were going to the same places a lot, and one from 1970 when I would have been nine years old, and looking forward to Western Auto visits to window shop at all the "hobby batteries" and bicycles. While many of those stores lasted for years, the USPO is the only original tenant left. Interestingly (to me), I can't for the life of me recall a Gene's Pig 'n Chick in Trenholm Plaza at all, and I would have thought it would have stuck in my mind. I don't recall those dentists either, and in fact am a little surprised by seeing non-retail there. 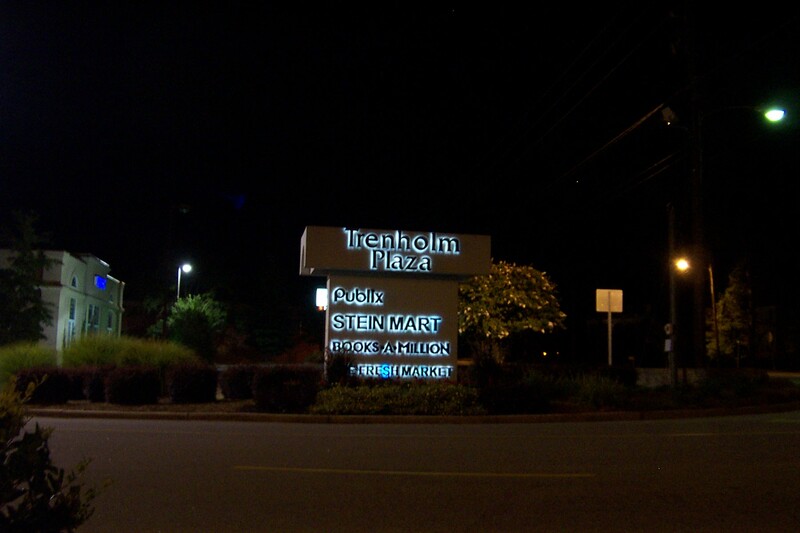 UPDATE 11 October 2013: Look at this great 1979 picture of Trenholm Plaza. Be sure to zoom all the way in, and pan around. Thanks to commenter Dennis for finding this! Subscribe to comments with RSS or TrackBack to 'Trenholm Plaza, then and .. then: 1964, 1970'. Interesting. Of course it wasn't a "win/win" for the businesses forced out.. I think the dentists were in a seperate building next to Standard Savings. I don't recall the Pig & Chick either, but I don't see Ponderosa Steak House listed. Wonder if it could have been a 'doing buisness as" or D.B.A. situation? I thought the Trenholm Plaza remodel was going to add a multi stories to the building where Hooligans is. Thanks for the article. I could never remember the name of the delicatessen, but I remember that it had good pastrami sandwiches. @Tom: I think Ponderosa came in after 1964 and burned down before 1970. It was more or less where Chipolte is. @CDG: The article Andrew linked mentions that the original plan was to tear down the Holligan's wing and build new, but that got deep-sixed by the arrival of the economic collapse and they opted to re-model instead. Three of the stores have the letters 'clo' after them. Anyone know what this stands for? It appears to me that if a store's name does not make obvious what it sells, they put a short description in lower case after the name, Ie: "Jorj Galleries art gallery", or "Rose's Stores Inc dept store"
My assumption is that "clo" would be "clothing". 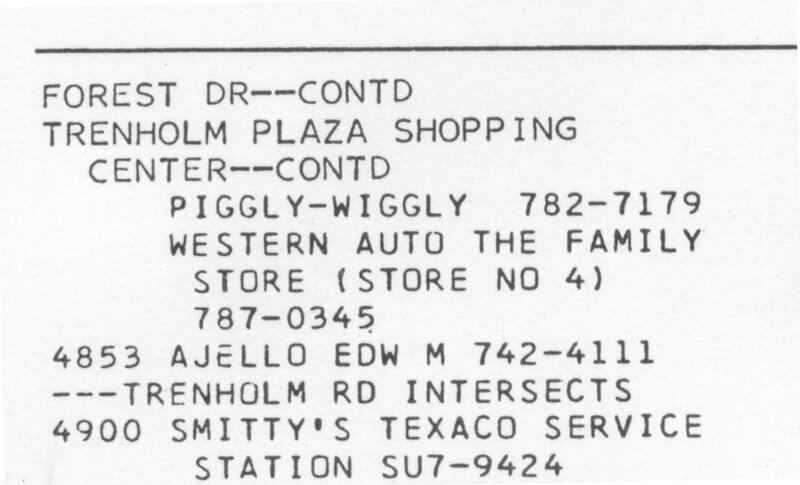 I just noticed the old alpine and sunset prefixes on some of the telephone numbers in the 1964 directory. That takes me back. Take a look here and here to see the old prefixes fully deployed. I found some old stationery of my grandfather's that showed his telephone number as 4-3539. Later it became AL4-3539. Dr. Salter's office was in that same out-parcel where Humphries' Barber Shop, the book store and Ed. Robinson was. Loved buying shoe's at Garber's- you always got a silver shoe with candy and a whistle. Tapp's Twig (CLO for clothing) was opened late on Thursday and I would plead with my mother to take me shopping there on Thursday night! my first checking account was at Standard Savings and Loan. Folks, check out this great 1979 picture Dennis found! Be sure to zoom all the way in and pan around. Hello, we are trying to remember the name of a gift shop that was located in Trenholm Plaza. I remember going to it when I was in first grade so about 33 years ago. It was in the corner by the post office. It was not Kitty's Hallmark Shop. From what I remember there were gifts, candles, dolls, perfumes. I remember it always spelled good. I just can't remember the name. Does anyone remember this place? Plaza Card & Party Shop?